For pet owners, the animal of the house is another member of the family. Just as with a child, we feed them, put a roof over their heads, and when they are sick we take them to the doctor. But just like any member of the family, pets can cost us money and not always in obvious ways. Because of this, we are not always able to combat the expenses we incur. As a result, the key to counteracting these costs is to identify them and then remedy them with simple solutions. The following are a few tips that can help you recognize your expenses and reduce your spending. Today there are a wide variety of pet toys on the market, as everything from chew toys to stuffed animals and frisbees fills the aisles of pet and grocery stores alike. With such a wide collection of neat and novelty products, it is easy for pet owners to lose sight of the simplicity that goes into putting some of these toys together. Because of this, animal Moms and Dads everywhere end up spending more than necessary to try and give their pet something they could have created easily and without having to reach into their wallets. In order to begin reducing this expense, consider embarking on a DIY pet toy project. You can buy cheap knick-knacks to use or just recycle items you already have in your home. Get creative by knotting off a tennis ball within an old t-shirt or wrap a towel into a tug-of-war rope. There are a plenty of ideas online too, so put on your resourceful cap and see what ordinary things you can make extraordinary for your pet. Just like we need to keep track of the expenses we incur for ourselves, all too often it is easy to forget that we should try and keep track of what we are spending on our pets. In putting together a budget, there are a couple of strategies that can be considered to help you optimize your spending and get the most bang for your buck. Start by identifying the things that your pet needs, specifically food and water, along with the quantity and frequency of your purchase. From there, break the budget in “nice to have” such as toys and grooming. Finally, be sure to create a savings allowance. The allowance is to stay on top of possible unforeseeable events, like a trip to the vet, and should hopefully go untouched month to month. When you are comfortable with your budget on paper, you can begin enacting it. See where you are spending the most money and if you can make any cutbacks. Doing this correctly will provide you a lovely little monthly bonus. During the warmer months, one habit that most people have is turning on devices like the thermostat and ceiling fans to cool off the temperature with their homes. This is done to create a reasonable environment for inhabitants but comes at the cost of a slightly higher electric bill. When families have to leave their pets in the house for lengths of time, they make sure to keep the home at a cool temperature for their animals. While this is good and conscientious behavior, often times it is unnecessary as most pets can safely remain without the need for a fan in 78-80 degrees. In the event you are still worried about your pet, you can take other steps like closing the blinds to mitigate the amount of heat that gets into your home. You can also consider taking your pet and putting them in a cooler part of the house while you’re out. Similar to the misconception that pets need fans or other cooling technologies, many people believe that animals require the lights within our homes to be turned on in order to see and navigate accordingly. Night vision for dogs is three times stronger than it is for humans and cats have even better sight in the dark than they do. Not only does that mean they don’t need all those lights turned on, it also means there is yet another area where you can save. When animals do good or we just want to spoil them a bit, one of the most common rewards we give them is a treat. While this is a big deal for them, it could be an even bigger deal for us, not all treats are made equal, and their prices are evidence of that. The good news is that this expense can be reduced by taking matters into your own hands. Making your own treats is a great way to save a little money, while also giving you the chance to know exactly what is going into your pet’s body. That means that you can help your animal eat a bit healthier and cut back on spending. And in the event you don’t feel quite so confident in your cooking abilities, a basic kibble snack never hurt anybody. Pets, like people, are in constant need of shots and other preventative medicines to live happy and healthy lives. The downside of this is that getting the proper treatment for your animal often means dishing out a sizeable sum to keep them in tip-top shape. While this tip does not serve as a way to minimize the upfront cost, it is meant to help you save down the road. 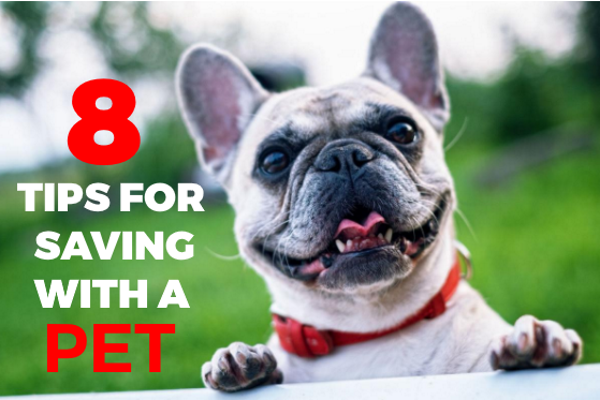 Preventing something for a pet is much cheaper than having to treat it, later on, so by keeping your furry friend updated with all of their respective vaccinations, you will be helping them and yourself. Many tank based pets have specific requirements when it comes to lighting and heating. For fish within filtering environments, tanks are constantly running and burning through electricity. To make sure your tank is using up the energy efficiently, consider making the tank lights LEDs. LEDs require half as much energy as fluorescent and incandescent bulbs and have a much longer life. For reptiles that require lights and heat lamps, you can manage your energy usage by putting lights on timers that automatically cut the power. This will promote schedule-based behavior for your scaly pals while also saving you money. While it is quick and easy to run up to the store and fetch your pet something, it is becoming easier and easier to buy supplies for your pets online. In addition to online coupons, pet sites can offer a range of benefits like free shipping or discounts based on bulk or frequent purchases. There are a number of ways to play this as you can consider splitting the cost and the goods from a larger order with a pet-owning friend. This little hack will get your pet exactly what they need and further reduce your spending, thus increasing your savings. It is the job of pet owners to make sure their companions are cared for and happy, but at the same time, it is important to do so without breaking the bank. With each and every expense that is incurred when caring for an animal, there are ways to save. Though it may take some creativity and elbow grease, finding the tips and tricks that work for you(whether listed above or discoveries you have made on your own) are the key to taking control of your spending and helping you to live a happier life beside your companion. Bio: Douglas Keller has been a financial expert for 20 years, helping people reach financial stability. He now provides personal finance tips on his blog Peak Personal Finance, where he helps people save money on their bills every month.